Frank McGauley left us about a month ago. Frank loved people and people loved Frank . He was forever greeting people in town or on the road, at his house or even when they drove by he had the hand up for a big wave. 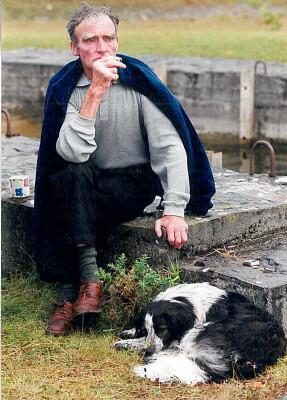 The Frank we all knew was a simple, but very complex character, he loved music, the lake, the horses, a few pints, but most of all he loved family and friends, and when he got something into his head, he stuck to it like a dog with a bone until he got his way – speaking of dogs… it would be difficult to speak about Frank and not to bring up the dogs. They were his constant companions at home, on the lake, and in the pub. He worried about them and gave them the best of care. Whenever he left them at home they repaid him by eating the furniture and cushions. Frank was happiest on the lake. He loved everything about it and fought like a badger during the rod licence dispute. He loved fishing, and talking about it afterwards in Faherty’s Pub, where all the stories were swapped about the fish that got away or play a game of cards for one of them. Then the day was ended and the dog and bike would bring him home.